There are many differing opinions about the history behind handfasting. As I am originally from England, I do lean towards the version of things that I grew up with. In general the belief is that when a couple wished to live together in a committed relationship they would declare their intentions before the village, usually in a ceremony overseen by the local chieftan, clan leader, elder or wise one. Basically anyone who had a status of authority and power within that community. The symbolic tying of the knot around the hands signified their joining. This view goes on further to suggest that this ‘binding’ was valid for a year and a day, upon which time all would gather to see the couple reaffirm their commitment and vows. This was, like many things of the times, a matter of common law, that is handled by the people themselves according to their custom. I’m pretty sure that it did vary from region to region. Once it became more common to have a member of the clergy officiate a marriage the practice began to die out. Remember a big church wedding was usually something only the wealthy or landed could aspire to. The local tavern wench would not be accorded the same rights. As time progressed the ability to have a church wedding spread to the general population and the church assumed the rites of marriage, although Civil Registration of births, marriages and deaths started on 1 July 1837 in England and Wales. For those not familiar with a registrar, this is an official office that acts as a statistician/registrar of births, marriages and deaths. Modern handfastings can be of several types according to your needs. I officiate many per year but mainly as part of a legal marriage ceremony. The act of binding the hands takes part during the exchange of vows and is a great visual for your guests. I create custom ceremonies, so each one would be unique to the couple, pretty hard to generalize the method. 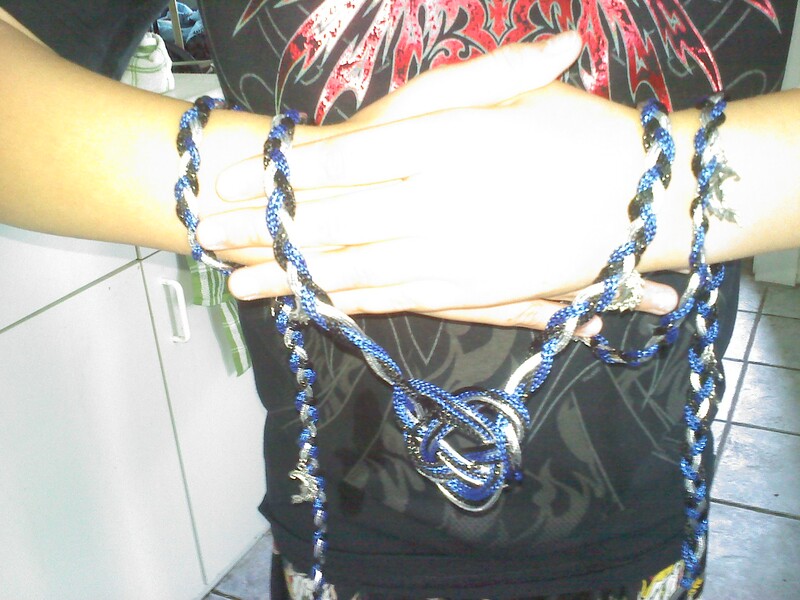 Simply put, a basic handfasting involves wrapping a cord in a figure 8 around the two joined hands. This creates an infinity symbol and ‘ties the knot’, vows and/or blessings are made at the same time, colour of the cord indicates a symbolic meaning. The symbolism is tailored to reflect the spiritual path of the couple being bound together. Many cultures include a binding of the hands within their marriage rites and it’s easy to see why. The materials needed are totally governed by the couple’s wishes and the vows accompanying the binding can be either a traditionally used ritual [usually within a religious ceremony] or simply used to encompass the custom declarations of love to each other, or blessings from friends and family. I do create custom cords for the event, and can include celtic knotwork if so desired. Please do allow time for these to be made. The picture below shows one that was designed for a wedding in 2010. This couple will be re-using the cord each year. They have an arrangement for me to officiate for them every year and a day to follow the old tradition according to their spiritual path.